I received this little goodie last Thursday and did a little squeal when I saw it because this is a much-hyped offering from Jo Malone that many a big YouTuber has recommended. I was so excited to finally try it because when I was listening to people rave about I faced one distinct challenge – what the hell does it smell like? Okay, it’s going to be a musky floral but seriously what the hell is Blush Suede when it's at home? Spray so much perfume you create a cloud around you. Immediately smell crisp fresh apples. Let perfume sit on skin for about 20 seconds and sniff hard and continuously so that you can follow it as it transforms on your skin. Do this so much that you successfully annoy people around you with numerous short, sharp inhales. Detect florals and start worrying that you are going to end up smelling like a generic Granny. Feel reassured as a light musk base starts coming through to add balance. Enjoy the light leather dry down that comes after a couple of minutes and lasts for about 4-5 hours. I wouldn’t say that this is a complicated fragrance but I would a repeat a word that I say above - it’s really nicely balanced. It’s not overtly musky nor too floral – it’s just warm and understated. It’s the sort of scent that you’ll like but you won’t be sure exactly why. A little frustrating and addicting at the same time. 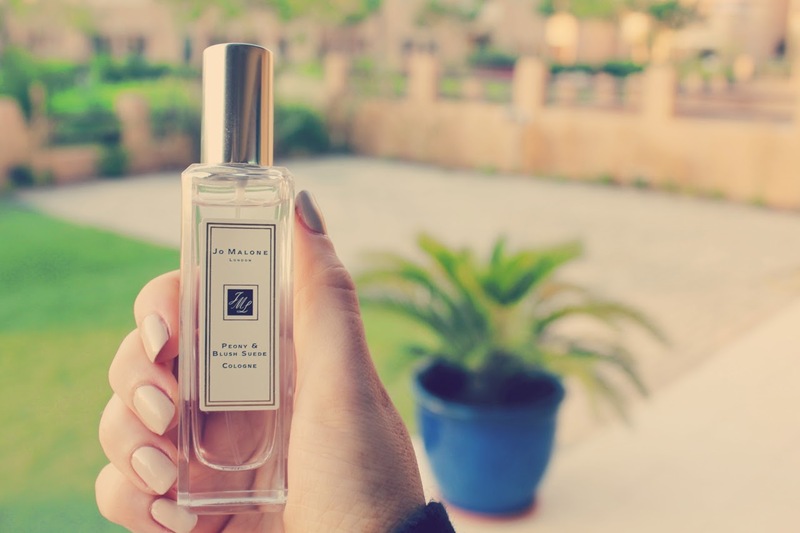 You can of course layer this to add more complexity and Jo Malone recommends Pomegranate Noir (PN) – one of my all time favourites. I am passing through duty free at the end of this month and I think a little 30ml spray version of the PN will have to be purchased. I can’t wait to see how a deeper, more masculine fragrance pairs with this one. Have you tried Peony and Blush Suede? PS. I bought a dress today because it was featured in the Daily Mail. My reasoning is that Beyonce looked really good in it....although when does she ever not look good? This is a very accurate description of this perfume! It's so hard to pin point what it is about it that makes it smell so blummin' lovely however I think your fragrance journey hits the nail on the head! :) I love this perfume, I used mine up this week, it's very easy to plough your way through! It almost has a 'powdery' scent to it doesn't it? You're right...describing it is very difficult! I so wish to try Jo Malone. Probably next time. Loving your description of this perfume...I think you described it exceptionally well!!! 'What's blush suede when it's at home?' really cracked me up!! I've smelt this in store a few times and absolutely love it! It's currently top of my fragrance wish list! I had the tester of this with my Nutmeg and Ginger fragrance as they were recommended as two to combine, both are beautiful on their own but together are amazing. The combinations are definitly a selling point to Jo Malone! I have asked for three samples of this exact perfume scent. I've used up all three samples within 4-5 weeks...I think it's time I buy it. Gonna have to sniff this one out. I know the exact dress you're talking about as I saw the DM feature, it looks very flattering - can't wait to see you in it! "What the hell is Blush Suede when it's at home" made me actually chortle. Love your writing Laura! dying to try. I've heard so many rants and raves, but haven't smelled it myself yet. so good to know you love it! I so desperately want this fragrance now. But they're so pricey so I'll have to wait til my bank balance allows it. And you've done an absolute lovely job describing it. Great description of the fragrance. I agree that it always seems so silly in magazines when they try to write about how different fragrances smell...but I think you captured it! I've never been one to layer fragrances, and I'm not really sure how to do it. Does anyone have tips? I LOVE that perfume! I got it about a month ago. I made a beeline to that particular one, having also heard all about it on YouTube and such. Mine won't last long either, that's for sure. I will definetly be buying the big bottle next time. You just have a way with words! Loved your fragrance journey, need to try this now with every perfume. OH MY GOSH. This perfume is just so addictive. How is it looking, run out yet?! Now I want to get through the next step of layering! If you already made it using Pomegranate Noir, please blog about it, I'd love to hear your experience.